Carlos Cruz-Diez belongs in a group of artists who have managed to sail the troubled waters of 20th-century art, defined by the dialectic opposition of contrasting elements: flatness vs. volume, colour vs. achromatism, static vs. dynamic, expressionist vs. expressionless. Born in Caracas in 1923, Cruz-Diez showed an early interest in perception phenomena caused by the simultaneous observation of figures painted with different, usually opposite, colours. These experiences resulted in “physiochromies” — metal plates painted with bright, saturated colours which, when observed by a moving viewer, produce an optical effect of motion and iridescence. 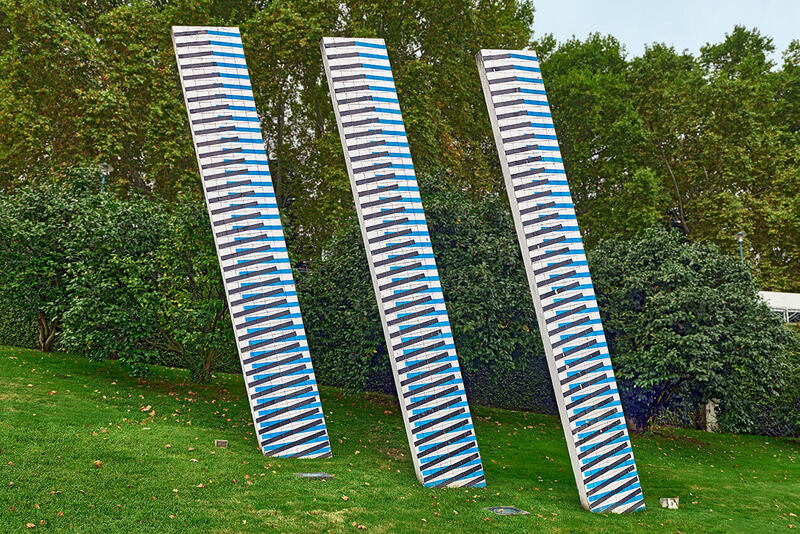 When seen from a moving vehicle or by a passerby, the three leaning plates in Avenida Unisco Godiniz show two line sequences (one black, the other greyish-blue) against a white background. When these two lines cross, they create the illusion of undulating silk. Their vibration, explicit in the piece’s title (induction to yellow), induces the missing colour, yellow. Considered as one of the most important 20th-century colour researchers, Cruz-Diez has developed his oeuvre from the kinetic art of the 1950s and 1960s, which he has described as “Arte del Movimiento y Espacio reales” [art of actual movement and space]. All his artistic production, based on permanent research and experimentation, has sought to expand the notion of colour by showing that perception of a chromatic phenomenon does not depend on form.